Are You Coddling Or Killing Sin? We are all familiar with the story of when King David committed adultery with Bathsheba. We are also familiar with David’s attempts to cover up his sin, and how one sin led to another. We are familiar with chapter twelve when the prophet Nathan, sent by God, confronted David about his sin. Finally, we are familiar with the unfolding consequences of sin that grew out of this terrible act. But oftentimes overlooked in this story is a small phrase that David said to Joab. After David had issued a command for Uriah the Hittite to be purposefully and strategically placed on the front line of battle making him a prime target to be killed, and after the Uriah actually was murdered, he said to Joab, the commander of the army, “Do not let this thing displease you.” The Hebrew text reveals more about this often overlooked statement. David literally told Joab “not to view what has been done as evil.” In essence, David was downplaying his sinful act of murder. He described his horrible deed to Joab in such a way that his words served as an attempt to discount and lessen the severity of what he had done. David had become nonchalant about his sin and wanted those around him to become nonchalant about his sin as well. But even more intriguing is what God thought about what David had done. In our passage above we see that what David had done was seen as evil in the sight of the Lord. David “blew off” what his sinful actions but God did not. The Hebrew language allows us to see the severity of this contrast. David says, “Don’t think of it as evil” and God makes it clear that what had happened was evil. Make no mistake about it, what God thought about David’s sin is of greater importance than what David thought of his sin. Are you coddling your sin, by blowing it off and thinking that it is really not a big deal? If you are, then know this; God takes sin seriously, and He wants you to do so as well. No amount of disregard on our part about the severity of our sin can take away the actuality of the severity of our sin. Your sin is offensive to God. Your sin, if not dealt with, will destroy you. It is in our sin nature to gradually become more accepting of sin in our lives if we do not kill it. It has been said that either you kill your sin or your sin will kill you. These wise words ought to be burned an etched in your heart as a reminder of the dangerous pitfall known as sin. And when you become nonchalant about your sin and begin to take your sin lightly, you are going down a path that will eventually lead to devastation and destruction. So one of the best things that you can ever do to maintain spiritual health is to always keep before you the severity of your sin, and to keep fresh on your mind what God thinks about sin. Remember, sin might be sweet to the taste, but it always leaves a bitter aftertaste. Satan wants you to get soft on sin. But guard your heart against developing an indifference towards sin. Such indifference serves as an indictment upon your personal spiritual condition. Rather, ask God to help you see sin for the horrific offense that it really is and the reality of its ugliness. 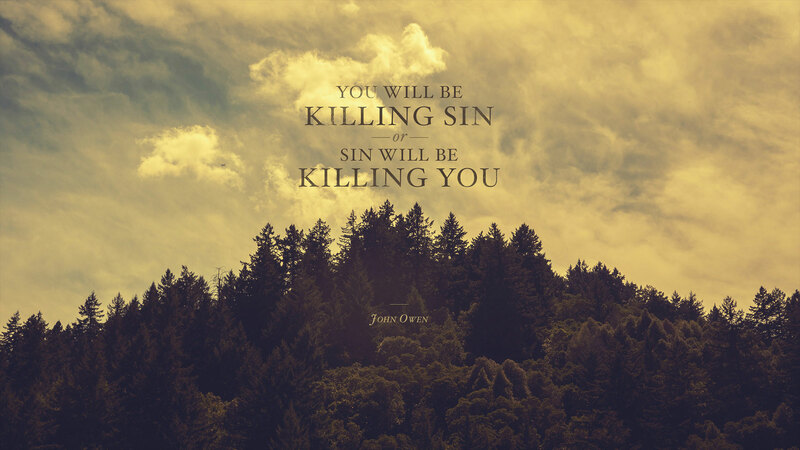 Oh that we would be in the business of killing sin!